I recently went to a birthday party for a friend and brought donuts with me. I've really been on a donut kick. For this batch, I wanted to make them extra special - just that added touch of Filipino awesomeness. And believe me... they were awesome. If you want to make these, take a buttermilk baked donut recipe (now don't think I'm holding out on my recipe... I just don't remember which one I used) and add to it ube halaya. It's the stuff in the jar. This ube has sugar already added to it, so you can scale back on the sugar in the recipe. Or not. Your call. I may have used a little over 1/4 cup. Maybe more. I wasn't really measuring. Bake as you would any baked donut. Toss in sugar. Practice self restraint and share these delicious purple treats. You can up the purple hue with some food color, but it's not necessary. I got to the party with donut container in hand and I swear donut radar kicked in. I think they were hidden at one point, but everyone had a chance to try them, including the birthday boy. I'm not sure if there were any left when I headed home, but I sort of recall someone asking for the recipe. If I were you I'd stick to the larger donut pans. Those minis can be tricky. 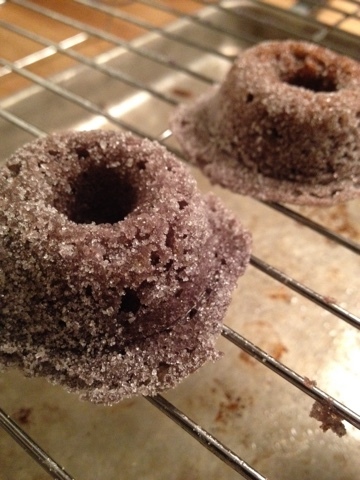 Plus if you overfill them they look like mini bundt cakes.